• Soy Protein Concentrate, an ingredient that is utilized in milk replacement formulations, is rich in amino acids which are required building blocks of protein. Soy Protein Concentrate provides amino acids for hormone synthesis, nerve function, muscle growth and connective tissue replacement. Several amino acids are undersupplied in equine hay and pasture diets, including lysine, tyrosine, and tryptophan. By boosting the diet with amino acids that are the “weak links” the body is better able to utilize more nutrients without the inefficiencies produced by poor quality protein diets. For example, tyrosine is a component of thyroid hormone and the neurotransmitter dopamine. Dopamine also functions in the brain as a regulator of many hormones and enzyme systems, including adrenal function. Research performed in the 1970s – 1980s by J. F. Gravlee, DVM, MS, CNS, the founder of Life Data Labs and Farrier’s Formula®, established the relationship of tyrosine and adrenal hormones (including cortisol) with poor connective tissue health and syndromes related with obesity. Dietary tyrosine is a natural means of regulating these syndromes, and has always been important in the formulation of Life Data Labs, Inc. nutrition products. • Alfalfa meal is highly palatable to horses, and contains many nutrients including carotene. The horse converts carotene to Vitamin A. • Lecithin contains high levels of omega fatty acids, phospholipids, choline, and inositol. Phospholipids, including phosphatidylcholine, are critical to proper moisture balance within cell membranes. Omega 3 fatty acids reduce inflammation and add strength and pliability to connective tissues. Skin, hoof and hair are connective tissues. • Yeast culture is a rich source of B-Vitamins such as biotin, thiamine, riboflavin, folacin, and pyridoxine which are necessary for good metabolism and healthy dermis. The yeast also aids in digestion by serving as probiotic enzymes for beneficial intestinal microbes. • DL-Methionine is a sulfur-containing amino acid important for the proper utilization of lipids and building the sulfur crosslinks that add strength and pliability to connective tissue proteins. • Selenium functions as an antioxidant and is important for proper health. Selenium is deficient in soils of some geographical areas. However, selenium is also toxic when given in excess amounts. The Barn Bag® contains selenium in proper levels and ratios with other interrelated nutrients such as copper and Vitamin E.
• Magnesium in the diet is necessary for normal muscle control and has been shown to have a calming effect. • Lysine is often a limiting amino acid in the diet, and is considered deficient in grain and grass diets. The addition of lysine to the diet allows efficient utilization of other amino acids in the building of protein, especially muscle protein. • Vitamin E functions along with selenium. These two nutrients can replace each other in approximately 75% of their functions, and are also important antioxidants. Increased risk of exercise induced muscle damage has been connected with lower tissue Vitamin E levels. Lower levels of Vitamin E in the diet may also decrease performance. Additional Vitamin E in the diet is also linked with improved immune response. • Vitamin C (Ascorbic Acid) addition to the diet is traditionally believed to be unnecessary in horses. However, research conducted by Life Data Labs established that stabled or stressed horses often have minimal blood levels of Ascorbic Acid and therefore benefit from supplementation. Vitamin C, along with copper, is required for the formation of healthy and strong connective tissue. • Manganese is essential for carbohydrate and fat metabolism, cartilage and bone formation. • Zinc is important for a healthy immune system, skin and hair coat. Deficiencies in the diet lead to weak tissue and a condition called parakeratosis. • Biotin is a B-vitamin that has many functions including essential roles in fatty acid metabolism; however the hindgut bacteria are a source of sufficient biotin for most horses. 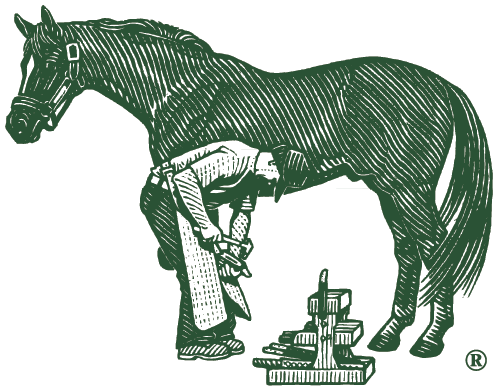 Research available through Life Data Labs indicates that only the hooves from horses with compromised hindguts benefit from biotin supplementation. • Pyridoxine (Vitamin B6) deficiency leads to muscular weakness, anemia, poor hair coat, poorly functioning immune system and neurological tremors. Pyridoxine is important for normal glycogen utilization and red blood cell function. • Thiamine (Vitamin B1) plays an important role in nerve transmission and carbohydrate metabolism. The manufacturing and processing of feeds and grains greatly reduces thiamine levels. • Folic Acid (Folacin) is important for blood cell formation and proper maintenance and repair of tissue. • Vitamin A is necessary for healthy vision, dermal tissue and proper immune function. • Vitamin D3 helps maintain proper blood calcium and phosphorus ratios and levels. • Iodine and tyrosine are the components of thyroid hormones. Thyroid hormones regulate metabolism and therefore influence activity and body weight. • Most nutrients that are listed in the Guaranteed Analysis occur naturally in the ingredients. Over 80 nutrients, including many that are not listed in the Guaranteed Analysis, are provided in the correct amounts and ratios to balance equine grass hay and pasture diets. • Whole oats can be used as an additional energy source. The nutrients in whole oats are metabolized (utilised) with the production of energy. *Barn Bag Pleasure and Performance Horse Feed Concentrate does not contain added sugars or molasses. The daily intake of starches, carbohydrates (WSC and NFC), and sugars from Barn Bag is very low, and is insignificant relative to the starch, sugar and carbohydrate intake in the total diet. 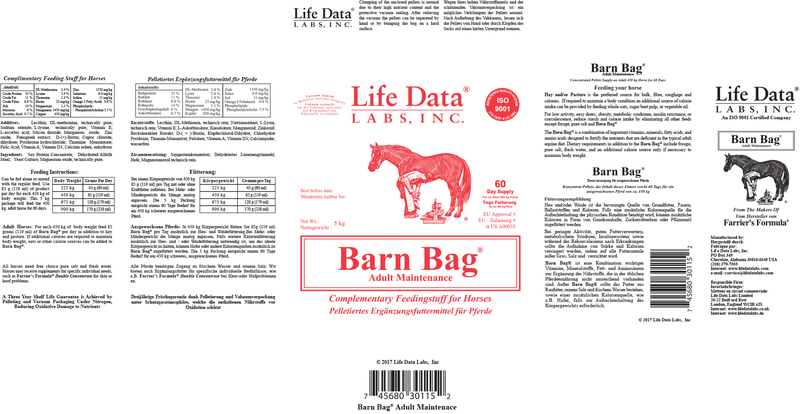 ***Barn Bag does not contain added potassium; however potassium is contained in minor concentrations with some of the ingredients such as alfalfa. Considering the small amount of product, the total level of potassium intake from Barn Bag relative to the intake in the total diet is not significant.